Showing results for tags 'blackened'. Celiac.com 04/06/2019 - If you’re looking to add a bit of snap to your next meal, look no further. This simple recipe covers fresh tilapia or other firm white fish in a blend of herbs and spices. Give it a quick sear on each side, and call it dinner. Crunchy and spicy on the outside, tender and juicy inside. It’s sure to honor its roots and leave your hungry eaters satisfied. Yum! Ingredients: 4 tilapia, catfish, or redfish fillets 1 cup long-grain white rice 2 cups fresh flat-leaf parsley 1 teaspoon grated lemon zest 3 tablespoon olive oil 3 tablespoons paprika ¾ teaspoon garlic powder ¾ teaspoon dried thyme ½ teaspoon onion powder ¼ teaspoon cayenne pepper 2 tablespoon fresh lemon juice 4 lemon wedges Kosher salt and black pepper Directions: Cook the rice according to package directions. Meanwhile, in a food processor, pulse the parsley, lemon zest, 2 tablespoons oil, and ¼ teaspoon each salt and pepper until finely chopped; set aside. In a small bowl, stir together the paprika, garlic powder, thyme, cayenne, ½ teaspoon salt, and ¼ teaspoon black pepper. Brush the lemon juice over the fish, then coat in the spice mixture. Heat the remaining tablespoon oil in a large skillet over medium heat. Cook the fish in two batches, adding extra oil if necessary, until the fish is beginning to blacken and is opaque throughout, 2 to 3 minutes per side. Fluff the rice with a fork and fold in the parsley mixture. Serve with the fish and lemon wedges. Celiac.com 04/19/2016 - Blackened Redfish is a Cajun classic that can also be prepared quite nicely with the much easier to find Tilapia. This recipe delivers a tasty, flavorful version of blackened fish that pairs well with slow cooked red beans and rice. It's easy to make at the end of a long day. Just cook the fish and rice, and serve up the beans. Blackened Fish Ingredients: 4 tilapia fillets 1 cup long-grain white rice 2 cups fresh flat-leaf Italian parsley 1 teaspoon grated lemon zest 3 tablespoons olive oil 3 tablespoons paprika ¾ teaspoon garlic powder ¾ teaspoon dried thyme ¼ teaspoon cayenne pepper 2 tablespoons fresh lemon juice Kosher salt and pepper Lemon Wedges Directions: Cook the rice according to package directions. Meanwhile, in a food processor, pulse the parsley, lemon zest, 2 tablespoons oil, and 1/4 teaspoon each salt and pepper until finely chopped; set aside. In a small bowl, stir together the paprika, garlic powder, thyme, cayenne, ½ teaspoon salt, and ¼ teaspoon pepper. Brush the lemon juice over the fish, then coat in the spice mixture. Heat the remaining tablespoon oil in a large skillet over medium heat. Cook the fish in two batches, adding extra oil if necessary, until the fish is beginning to blacken and is opaque throughout, 2 to 3 minutes per side. Fluff the rice with a fork and fold in the parsley mixture. Serve with the fish and lemon wedges, if desired. Slow Cooked Red Beans and Rice Ingredients: 1 pound andouille sausage, sliced into rounds 1 large sweet onion, chopped 1 green bell pepper, chopped 1-2 tablespoon gluten-free red pepper sauce, to taste (optional) 8 cloves garlic, chopped 1 teaspoon ground black pepper 1 teaspoon Creole seasoning, or to taste 6 fresh basil leaves, chopped 1 ham hock 4 cups cooked rice Place the beans and water into a slow cooker. Heat a skillet over medium-high heat. Brown the sausage in the skillet; remove from the skillet with a slotted spoon and transfer to the slow cooker. Reserve drippings. Add onion, green pepper, red pepper sauce and garlic to the drippings; cook and stir until tender, about 5 minutes. Transfer everything from the skillet to the slow cooker. Season the mixture with pepper and Creole seasoning. Add the fresh basil leaves and ham hock. Cover and cook on low for about 8 hours, until beans are tender. Cook until beans reach a creamy texture. Celiac.com 04/23/2014 - I don’t eat nearly enough southern-style food, in general, and enough Cajun-style food in particular. One thing I crave is Cajun-style blackened fish. Fortunately, it’s fairly easy dish to recreate at home. This recipe can be made with any good whitefish, like snapper or catfish, but is also good with fresh salmon. Pair it up with some rice, some greens, and a bit of gluten-free corn bread, and you’ve got the makings of a southern-style feast in your own kitchen. Ingredients: 4-6 Red Snapper, Catfish, or Salmon fillets, skinless 2 cups white rice 3 tablespoons paprika 1½ teaspoons kosher salt ½ teaspoon cayenne pepper 1 teaspoon dried thyme ½ teaspoon garlic powder ½ teaspoon onion powder 3½ tablespoons unsalted butter juice of 1 lemon 1 11-ounce can corn kernels, drained 1/3 cup finely chopped fresh flat-leaf parsley 1 lemon, cut into wedges Directions: Heat oven to 400° F. Prepare rice in advance, and keep ready. In a medium bowl, combine the paprika, cayenne, thyme, onion powder, garlic powder, and ½ teaspoon of the salt. In a saucepan, over medium heat, melt 2 ½ tablespoons of the butter. Add the lemon juice. Working with 1 salmon fillet at a time, dip the top and bottom halves first in the lemon butter, then in the spices. Heat a large ovenproof skillet over medium-high heat. Cook the salmon until blackened, 2 minutes per side. Transfer to the oven for 8 minutes. Stir the corn, parsley, and remaining salt and butter into the rice. Serve salmon and rice on plates with a garnish of parsley and lemon wedges. Blackening is a really fun way to cook fish. Nothing seems to beat the bold flavor that comes from a perfectly seared crust. 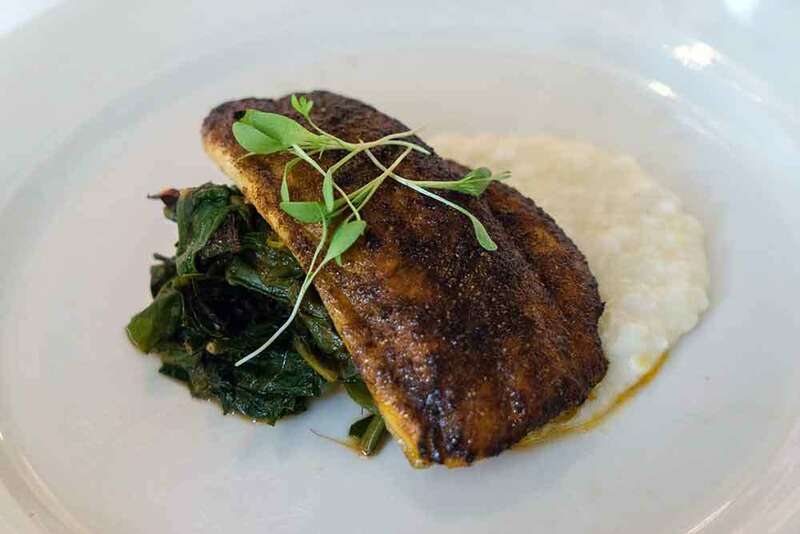 Blackening fish on a cast-iron skillet creates intense heat and smoke so always work in a well-ventilated kitchen. The rub in this recipe is one of many variations on a classic Cajun rub and is also perfect for chicken, beef steaks, or even vegetables. You can mix it up by serving different fish; snapper and swordfish would also hold up really well. Serving fish with lemon not only cuts the intense flavor of the spices, but also gives the fish a refreshing bite. Ingredients: 4 firm catfish fillets, 6-8 ounces each ½ cup olive oil, plus extra for drizzling 1 large lemon, cut into 4 wedges 1 teaspoon dried thyme 1 teaspoon marjoram 1 teaspoon coriander 1 teaspoon garlic powder 1 tablespoon paprika 1 tablespoon ground red pepper 2 teaspoons cracked peppercorns 1 teaspoon coarse salt Directions: Combine all spices to create a rub and spread in a shallow pan. Set aside. Heat a large cast-iron skillet until very hot, about 5-10 minutes. Meanwhile, rinse and pat dry fish. Generously coat both sides of each steak with oil and lay in the spice mixture. Turn to thoroughly cover both sides. Place two steaks in the heated skillet over medium-high and drizzle lightly with oil. Cook for 3-4 minutes and turn. Drizzle with a little more oil and cook for an additional 2-3 minutes, depending on thickness of fish. Remove cooked fish. Add additional oil if necessary and repeat with remaining steaks. Serve with fresh lemon juice, one wedge per steak.